I participated in an influencer activation program on behalf of Mom Central Consulting for Isis Wallet. I received a promotional item to facilitate my review. There have been times in my life when I wonder how I ever survived without a smartphone. I only started using a smartphone in 2011, and in these past short few years, I found myself being more organized and more productive. As if smartphones aren't already smart enough, on top of all of the amazing things you can already do with your smartphone, you can now use it as a wallet. You don't need to carry a planner around anymore because your smartphone acts as one. You don't even have to carry a computer around anymore! Now with brand new technology you don't need to carry your wallet anymore either. Well, your cards at least. What is this sorcery innovation? I was recently nominated for the Inspirational Blogger Award by Emma who is the blogger at My Beautiful Messy Life. She is also a part of the Her Campus Blogger Network. Thank you, Emma! I appreciate the recognition. There are no vowels in my last name. I have been to seven countries outside of the one I was born in. My favorite band has been Paramore for the last eight years. I have been blogging for nine years. I have been friends with my two best friends for almost ten years. My sister is also a beauty blogger. I graduated with a B.A. in English, but I ended up as a Marketing Specialist. I have decided to accept the Modcloth challenge. This week, we were asked to style the Abiding Beauty Dress in Black. This is how I would wear this dress. I participated in an influencer program on behalf of Mom Central for Dove. I received a product sample to facilitate my review and a promotional item to thank me for participating. 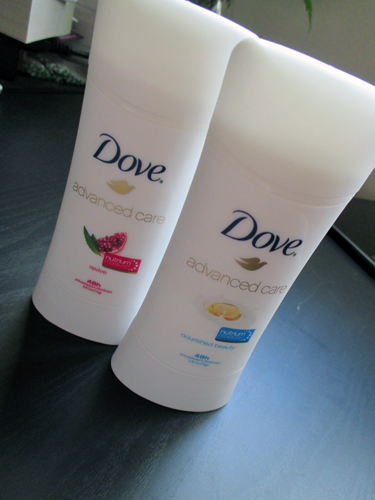 I have previously reviewed the Dove Advanced Care Deodorant in Revive and Nourished Beauty. You can read the review here. I have used the product for more than two weeks since I published my review, and my verdict still stands that I love this product. I still think that I have found the holy grail of deodorants. It appears that my September and April closet posts garnered a lot of attention, so I will officially be making it its own series! On the first day of every month, I will post lookbooks of outfit ideas for the month. This month, instead of creating the usual Polyvore collages, I will include a few examples of each trend along with a brief description of how you can work them into your own closets. I would love to hear your thoughts on which format you prefer! Without further ado, here is my June closet! The Summer is all about colors, so why stick to one when you can have three? A dress is also the easiest way to look put together without too much effort because you just slip it on, and you'll be ready to leave the house! I am so glad that the maxi hemline is back in trend. It is so versatile! I've been wearing maxi skirts and dresses for a night out in place of mini skirts and dresses and shorter hemlines because they're so figure-flattering and classy. They're also casual enough to wear to class. 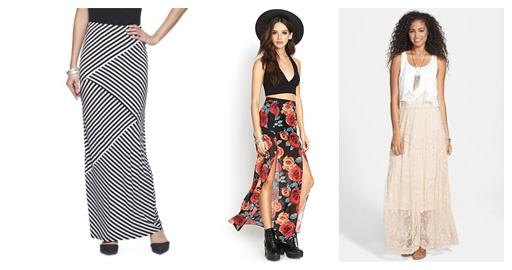 For ideas of tops to pair with maxi skirts, read my Ebay guide to wearing maxi skirts. Sheer blouses may look trashy and slutty to some people, but I honestly think that they're amazing because they are the easiest for day-to-night transitions. For the office, you can wear a tank top underneath the sheer blouse so that you're not showing an inappropriate amount of skin. After work, before you leave for margaritas with the girls, take off the tank top to reveal the lace bra or tube top that you can wear underneath your tank top. Behold, the queen of all Summer shoes! Unlike other shoes, strappy sandals don't make your feet sweat in the heat. They're also super cute and go with anything casual you could possibly want to wear. I want to point out that that Missguided dress is the ultimate combination of the trends mentioned in this post. It has the color for Summer, it has the maxi hemline, and it's a cutout dress! Cutouts seem to be everywhere these days, but I still prefer them on dresses because they make even the most mundane of dresses look playful. If you would like to get 6% cashback from Bloomingdales.com, 3.5% from Lulus.com, and 3.5% from Boohoo.com as well as discounts and promotions, join Ebates today! Thank you for reading, and don't forget to share with me your thoughts on this format as opposed to the other one. What trend would you like to see in your closet this month? I am not currently subscribed to any subscription services. Follow me on Twitter or Facebook to be notified of updates.